Miranda Dauphinee is a recently-widowed mom to four kids, living right outside of Charlotte, North Carolina. A native of the beautiful state of Vermont, Miranda says she was always a “wuss” about the snow, so she followed her parents to North Carolina about 15 years ago. What is your job, what is your title, and what do you love about your job? MIRANDA: I guess you could say I’ve got a few titles - Mom, first and foremost. And I’m also a certified holistic health coach. But my biggest job right now is serving as the executive director for a nonprofit organization that my friend Shaunna Rushing and I co-founded back in 2015. Tell us about your personal story of pain and redemption. MIRANDA: Ah, redemption. The goal we all chase after - or at least the one I chased after for many years. Over the last year, I’ve realized that redemption doesn’t always look like what we think it might. I wanted redemption of my story to look like sticking my pain in a beautifully wrapped box, tied with a bow - a Cinderella story of overcoming obstacles and turning into a beautiful, graceful princess, but that hasn’t happened. I don’t know what redemption will look like for me, but I know that it looks so much different than I expected. In 2010 I married my husband, and realized within weeks that I had walked into something tumultuous. I didn’t have a clue he struggled with addiction while we dated, but I figured it out pretty quickly into our marriage. Alcohol made him extremely volatile, so there were a lot of painful things I endured over the years. He was a pastor at the time, so this made it extremely hard for me to feel safe asking for help. I’d describe our marriage like being stuck on a high speed train barreling towards a cliff. Many times I felt like he was heading towards absolute destruction and there was nothing I could do but hang on and pray for something to save us. People often wonder why women don’t just leave volatile relationships. The hard part of situations like mine is that it’s never as easy as just walking away. In fact, it can be near impossible to do that. There were so many ups and downs, betrayals and heartache during that time. We were abandoned by our church, and some of our friends. In January of 2015, right after we separated, I found out that I was expecting our last child. I was in shock; my life was in absolute shambles and I couldn’t imagine bringing a child into this wreck of a family situation. In April of that year, he admitted himself to an inpatient treatment facility a couple hours away and began the hard work of getting sober. I moved to be closer when I was 8 months pregnant, and after 6 months of living in a sober living house, he moved into my home and we began the work of reconciliation. I thought I’d found my redemption. But it wasn’t an easy road, and neither of us knew where to start or how to fix just how broken we were. Our struggles at that time were overwhelming and it was an extremely isolating time in my life. We even tried living in a tiny beach town for a year, with hopes of finding healing, but he eventually relapsed. I couldn’t bear keeping us in such a volatile situation again so I left. There is no easy way for a stay at home mom of 4 to up and leave an abusive marriage, but we stayed with friends and in hotels for weeks until I was able to get into a house back in Charlotte near family. In May, my husband passed away extremely unexpectedly. I am still waiting for the final autopsy results, and all I know is that it was due to complications with chronic alcoholism. He was living with his parents at the time of his death, and I have so many unanswered questions. Right now, we are all just walking this journey of grief and I’m trying to make sense of my own complicated feelings while helping my children make sense of theirs. What do you wish you knew 10 years ago? MIRANDA: To trust MYSELF and stop living in fear of what other people think. I spent so many years looking to everyone else to validate my worth, my feelings, my emotions, my suspicions, my gut instinct - it has taken me too many years to realize that I already have access to the answers I need. I don’t need anyone else’s permission to do what I know deep down. Women are conditioned to believe we are too emotional and dramatic to have access to internal knowledge - it’s not true! I believe a woman’s emotions and intuition is one of her most powerful tools - it’s just flipping the script and realizing that those things can actually guide us in our most difficult times if we sit still and trust ourselves. How many kids do you have, and what are their ages? MIRANDA: I have 4. My oldest, Logan, is almost 18. Then there is Beckett, 7. Declan is 5 and Harper, my daughter, just turned 3. I also am a mommy to a sweet baby girl that I lost in my 2nd trimester back in 2012. We named her Lilia, which in Hebrew means what belongs to me, belongs to God. What is your idea of a perfect day with your family? MIRANDA: No fighting! We actually are big lovers of the beach and I loved that year we lived about a four-minute walk from the ocean. Any day that I get to soak up the sunshine and watch my kids play in the salt water is me living my very best life. If you had 24 hours to yourself, how would you spend it? MIRANDA: I’d catch up on a little sleep. And then I’d probably spend the day reading and writing. It’s a dream of mine to write a book one day, but I can never find the time in between the schedules of all the kids. What do you like best about your life? What would you change, if you could? MIRANDA: I love being a mother; it is my greatest joy. It’s also my greatest challenge, but I was definitely the girl in high school doodling the names of my future children. (None of those names made the final cut, by the way…) My kids and I have walked a hard road together and sometimes I wish I could change that but in truth, taking the pain of the last 9 years away would mean I wouldn’t be where I am today and I wouldn’t have my youngest children. There is a lot of anxiety for me about my future and how I’ll manage providing for everyone alone so I think if I could change that, I would. What’s one piece of unsolicited advice you’d give to a new mom? A single mom? MIRANDA: Again, trust yourself. A mother’s instinct is real. And in this day of social media and constant information overload, we can worry ourselves crazy that we are doing all the wrong things. Ask for help when you need it and don’t be ashamed if you do. The truth is, we are all drowning from time to time and everyone needs help. Single motherhood can feel like the most thankless job ever. Keep your head up, and know you are doing hard and holy work. Most single moms I know parent with very little support and it can feel like the weight of the world rests on your shoulders. You may have to fight to find your community, the people who will not just be there emotionally for you but with physical, hands on help too. Keep looking for them. You’ll need people. Even the most amazing mamas can’t do it all. Give yourself some grace and keep showing up for yourself and your kids. You’re a superhero in ways you don’t even know. You will feel as though everyone has forgotten you sometimes, so carve out a few minutes here and there to do what feeds your soul. It will make you a better person and parent. What is the best thing one mom can do for another? MIRANDA: Support her! No mom shaming, I think we are all trying to do the very best that we can for our kids. We’ll all have different approaches to life and parenthood and showing a little support and solidarity with another mama goes such a long way. MIRANDA: I went to college to pursue vocal performance, and even got a scholarship. Once I got there though, I realized I was nowhere near as talented as the others and couldn’t hack music theory so I flaked out. Changed my major about 12 times. Do you have any charitable organizations you like to work with/ donate to/ volunteer for? MIRANDA: Nourish Women’s Collective is the organization my friend Shaunna and I co-founded, so that’s the big one! Also Together Rising is one my favorite nonprofits to donate to. MIRANDA: This was a hard question! I love to try my hand at allll the things and can do a passable/good job at many things. But developing ONE talent that I’m an expert at is really hard for me. I can’t focus on one thing for too long or I’ll get bored and side tracked by something else that looks a little more exciting. I’ve wanted to pursue so many career opportunities because of this. MIRANDA: It gets better each year! She’s Brave is my very favorite day of the year. It’s a day unlike any other I’ve experienced - a true gathering of women who show up ready to have some real and genuine conversations. If you’re tired of women’s events that have more fluff than substance, you might just be our people. We always dig into the meaty stuff, the difficult things and topics other people stay away from because we know that when you bring that stuff into the light, shame can’t exist for long. We want our attendees to walk away feeling like they’ve left some junk behind, can move forward feeling a little lighter and a little more confident in who they are. What inspired you to launch She’s Brave? MIRANDA: I’ve wanted to put together a conference that addressed the hard stuff women face when I became a pastor’s wife. I was frustrated by how shallow so many things directed at women were. But when my friend and I accidentally started a nonprofit (Nourish Women’s Collective) we just went for it. We started gathering a few groups of women in our area to share a meal together and word spread quickly. We began expanding outside our area and into other states and decided to legally become a 501c3. This year we are announcing a big, new initiative for NWC that will include giving back to women in a very personal way for us. Shaunna and I share the same vision and passion for freeing women of the feelings of unworthiness and toxic shame and we couldn’t wait to bring hundreds of similarly minded women together to do just that. That first year we didn’t know what we were doing, and had never planned an event before. We just had a dream and we went for it. We got in touch with Glennon Doyle’s agent because why not, and pitched our conference to her. She agreed to keynote and came back for year two as well! This year we will hear from Ruthie Lindsey, Omkari Williams and Colleen Odegaard. How did you and your business partner meet, and how did you decide to go into business together? MIRANDA: Shaunna and I actually met at the church where my husband was pastoring at the time. 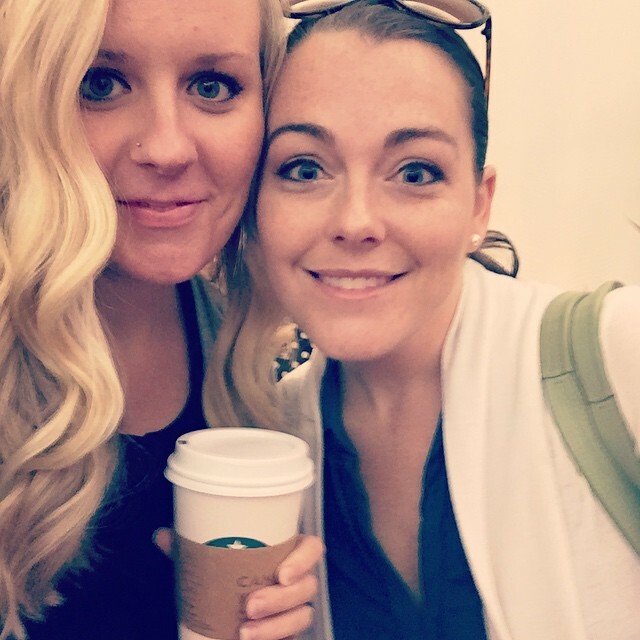 We got to know each other through a church small group, but I knew she was the kind of friend to keep around for life when I went through my second trimester miscarriage. We hadn’t even known each other that long, but she was one of the few people who instinctively understood how I needed to be cared for during that time. And as my marriage to my husband struggled and fell apart, she was always there to be my support. She saw me through some of the absolute most difficult times of my life. In 2015, we both were fed up with what felt like surface level friendships from church and were ready for something different. We wanted to create a place where women could come together without fear of being judged because they didn’t fit into a specific mold. To us, the table signified a place of community and belonging. A few friends agreed to host dinner groups at their homes and word quickly spread. By 2017 we had over 20 dinner groups throughout North Carolina and into other states. Over 250 women were a part of our community and each conference we hosted over 300 women. We hear it over and over again but we’ve found that women are desperate for this kind of community - we all long to be seen, heard and accepted. We want to be able to sit down over a meal and tell someone that life isn’t always ‘fine’ and know that we will be received with open arms and love. Shaunna and I work hard to cultivate that space for women - we are constantly learning and growing and changing and are really looking forward to what is coming for our organization this upcoming year. What’s your short-term goal? Long-term goal? MIRANDA: My short term goal is to be fully present with my children right now as they process their trauma and grief. There is so much to get done, and I have to stop myself sometimes and make sure I check in with them. Long term, I hope to continue sharing my story with the world in hopes that it helps even one person. I spent so much time trying to soak up words from other women who had walked a similar path as I was walking, so I know how valuable it is to share your story. I really hope to write a book or find speaking opportunities that will encourage women who are feeling scared and alone in unhealthy situations. Intrigued? Click here to learn more about Miranda’s event, She’s Brave.